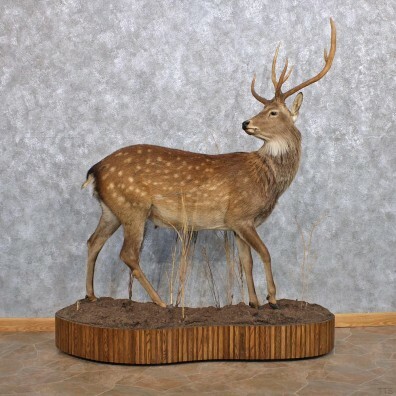 This is an outstanding Manchurian Sika Deer life size taxidermy mount. It is posed in a standing position with the head looking sharply to the right side back out into the room. It has extraordinary hair quality and great sized antlers. 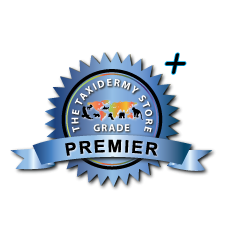 The taxidermy work is magnificent with highly detailed craftsmanship, earning our prestigious Premier Plus™ overall quality rating. All applicable dimensions are included to help ensure this item will fit within your intended display space. - Comes on a wood base with habitat for display. - Casters are included on the bottom of the base for easy movement on hard surfaces. The sika deer (also known as the 'spotted' deer) is a species of deer native to most of eastern Asia. Sika can also be found as far south as Vietnam, as far north as Russia and have been introduced to other habitats all over the world including United States ranches. Their coat is usually brown and red in appearance, with a speckling of white spots on it's back and along the sides of body, and the males grow tall, wide and more "upright" antlers compared to the traditional common deer.